Am I turning into a ‘difficult mother’? Happy Mother Day for yesterday! How was yours? As ever, the weekend supplements (hopefully delivered to your bed yesterday along with a hot cup of something, flowers and cards!) were full of features on various aspects of motherhood to mark the day. There was also a fair smattering of features looking at more controversial aspects of mothering, including a feature in the Indie on Saturday called ‘Mummy dearest? 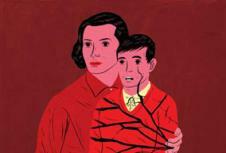 The pitfalls of life with a difficult mother’, by psychologist Dr Terri Apter. She scared the living daylights out of me. I didn’t recognise any of the definitions of a ‘difficult’ mother from my own childhood – my mum was and is a fantastic mummy – but I had a knot in my tummy as I realised that one of the pictures painted could be me. Not ‘Inflexibility and Rigid Expectations’, or ‘Need, Seduction and Resentment’, nor ‘Envy’, but ‘Unpredictable and Ferocious Anger’. They say ‘all mums shout’. But I didn’t, not when I just had DD. She and I rubbed along very nicely, thankyou – she was an angel, I was endlessly patient and kind, and once I’d got quite nasty PND under control, all was well. But somehow the arrival of DS two years later turned me into the shouty mummy I never wanted to be and certainly never saw myself as (the subtitle of this blog hints that I do secretly still want to be Mary Poppins). I remember this time last year when DS was only seven months old and just starting to eat proper meals, screaming at them both at breakfast time to eat up. I shouted so loudly, and quickly, that I shocked myself. And the year since has been pretty much a rollercoaster of me alternating between calm, smiley, patient, in-the-moment, funny, cuddly mummy and a ferocious dragon who shouts/barks at the click of a finger when a line is crossed and for an unthinking second I react rather than respond to the situation. My babies must be utterly confused, not to mention terrified on occasion. There is a volume, tone and depth to my fleeting but vocal anger that I don’t even recognise as my own voice sometimes . DD, now three and a half and pretty emotionally intelligent, occasionally checks in with me, asking if I am ‘happy’ – by this she means are you going to have a go at us about something in a minute. She also tells me she hates me shouting. I always apologise and we all have a cuddle, but I know this isn’t good enough. I don’t know where it comes from, this rage at inconsequential things (how could this be about anything but tiny things, they are very small children!). It’s like I see red and snap. And I don’t like it, I don’t like myself doing it, it achieves nothing and may well already have sown some very damaging seeds in my darling children. When I manage to pause, count to ten, tell myself ‘this too shall pass’, take a deep breath, smile, turn the moment into one of humour rather than anger, walk away or however I consciously choose to respond to whatever heinous crime my two smalls have committed, it is diffused and all is well. But all too often there is no consciousness to it – I simply react, and roar. I am an unconscious parent and this is not how it was meant to be! Blaming long-term lack of sleep since DS arrived or hormones goes a tiny way towards an explanation some of the time – I’m certainly worse before and during my period – but is still no excuse. I love my children with every ounce of my heart and soul and if anyone else ever spoke to them in the way I do, including their daddy, they too would feel my considerable wrath. Maybe recognising that this is unacceptable behaviour now is the first step to sorting it out and instead of my children being fearful of my ‘unpredictable and ferocious anger’ for the rest of their lives, finding a way to teach them that we all feel and are overwhelmed by anger and other difficult, negative emotions sometimes and there are ways of expressing it without anyone else being on the receiving end. A great post, and one that i reckon almost every mum in the world, myself included, can relate to. I think we all shout ‘unnecessarily’ & regret it instantly. Lets not beat ourselves up about it though – we all love our kids, and they know that – i think that is the most important thing a child can *ever* know.